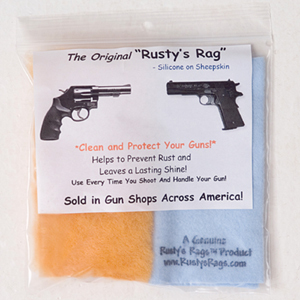 Rusty's Rag is a wooly sheepskin silicone cloth made in the USA. It is used to clean and protect guns and helps to prevent rust. What differentiates Rusty's Rag from normal silicone cloths is that Rusty's is not cloth. It is actually a 1-7/8" by 4-3/8" (approximate size) Canadian sheepskin pad impregnated with pure Dow Corning silicone. This soft pad is used to wipe down the firearm, and then the excess silicone is wiped off with a (included) flannel cloth. The 2007 list price is $9.50. Illustration courtesy of Rusty's Rag. "Rusty's Rags were developed by a serious Gun Collector with over 40 years of experience in the preservation of antique weapons. Rusty had great success preventing rust with the common silicone impregnated cotton flannel cloth sold in gun shops, but the cloth just would not get into the many 'Nooks and Crannies' on his gun." "He had tried a sheepskin wipe impregnated with preservative grease, but found it suitable only for long term storage. It simply left too much unsightly residue and smearing for guns which would be shown off to friends and fellow collectors. The obvious answer was to impregnate wooly sheepskin with silicone instead of grease, and thus Rusty's Rags were born." I experimented by using the supplied Rusty's Rag on a well-handled Colt SAA pistol. A quick sequential once-over with the sheepskin pad and flannel cloth failed to completely remove some of the fingerprints from the highly polished blue surface of the revolver's barrel. I attributed this to the fluffiness of the sheepskin pad compared to the conventional Outer's silicone cloths to which I am accustomed. But a second, more forceful, application of the sheepskin pad and subsequent polish with the flannel cloth left the gun's external surfaces glowing as advertised. The pure sheepskin pad seems to reach into nooks and crannies better than an ordinary silicone cloth. It was originally formulated specifically for firearms and does not leave behind lint. Copyright 2007, 2012 by Chuck Hawks. All rights reserved.